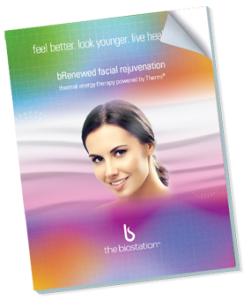 revitalize skin with our non-invasive facial firming treatment. bRenewed Thermal Energy Facial Perfecting Therapy is a non-surgical and 100% non-invasive procedure that uses gentle radio frequency to tighten and perfect the skin. This highly effective rejuvenation treatment stimulates your body’s own collagen production with temperature controlled thermal energy delivered to the skin with an FDA-approved wand. As the wand gently and gradually heats the skin’s surface to the target temperature, it treats problem areas around the forehead, eyes, mouth, cheeks and neck and activates dermal remodeling. Patients report that the procedure is fast and painless with no downtime, and often refer to the sensation as similar to receiving a hot stone massage. Discover the magic of thermal energy therapy and whether it’s right for you!